To make Tarragon vinegar, fill a widemouthed bottle with the freshly-gathered leaves, picked just before the herb flowers, on a dry day. Pick the leaves off the stalks and dry a little before the fire. Then place in a jar, cover with vinegar, allow to stand some hours, then strain through a flannel jelly bag and cork down in the bottles. The best white vinegar should be used. 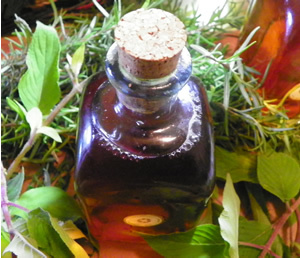 Recipe Instructions: Herbal Vinegar :You may find the modern method of making herbal vinegar a bit easier than these fireside directions. Culinary/Kitchen :You already have a powerful natural home health remedies in your kitchen. Culinary herbs like rosemary, sage and thyme not only add taste to foods, they make the food you eat better for you.